BugE - More than a bike, less than a car: Installing an inexpensive seat slider. Since I've never driven a BugE, I don't really know what seat position would be the best. So, I decided to put in some inexpensive seat sliders in case my guess was off a few inches. By doing so, I also have made the BugE easier to service since the seat can be completely removed from the sliders. The locking sliders I used were from Northern Tool for a bargain price of $14 plus $8 in shipping. The seat sliders do not come with hardware. However, I found it was easy to create the hardware. If the sliders are mounted directly to the fender, there are some barriers to seat sliding happiness. 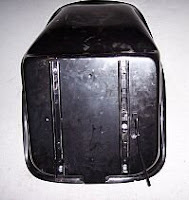 In the rear, the knob that secures the fender to the fender hump prevents the seat from going back very far. In the front, there is a "glove box" hump that prevents the seat from sliding forward for taking the seat off during maintenance. So, the sliders and seat are raised slightly to clear these barriers. Note: Although these instructions are rather detailed, you may want to use another model of seat slider. I've noticed that Northern Tool has stopped offering the seats these sliders attached to. So these sliders may not be available for too much longer. Pieces needed for mounting bottom rails to fender. 4- flat head caps (included in kit) that were on the bolts which now hold the battery tray on. a short length of aluminum pipe, at least 6" long with a diameter of 1/2" and a wall thickness of 1/16. Pieces needed for mounting upper rails to seat. First, put sliders on the BugE fender & drill 1/4" mounting holes as if you were to mount them directly to the fiberglass. I put the rear holes lined up with the rear knob and front holes 9" further front. This was my best guess to where my seat would normally be. Of course, where you decide to drill holes is up to you. Just make sure rails remain parallel with each other. To make the mounting hardware, I recycled some unused parts that were included in the kit. The black hex cap in the middle should look familiar. It's one of the four flat-head caps left over when the battery tray was installed. So these flat caps have found a new use. These caps can accept a 1/4-20 thread. Each of the 4 mounts consists of a flat cap, a (1/4-20) 1" hex bolt, two washers and some aluminum spacers that are cut from some stock aluminum. This arrangement will lift the sliders up and also give the clearance needed for the sliders to move properly by each other (inside the sliders, the tolerances are really tight). In the lower right yellow box, the new mount is shown assembled. The key to the slider mount idea is using an aluminum pipe to construct spacer parts. Aluminum needs to be used since the metal needs to be soft enough to cut yet strong enough to support the sliders & chair. On the upper right of the photo, one of these is shown installed on the rail. To construct the aluminum spacers, use a pipe cutter for copper pipe. Cut from the pipe, 4 spacers 5/8" long and 4 spacer rings 3/16" long. 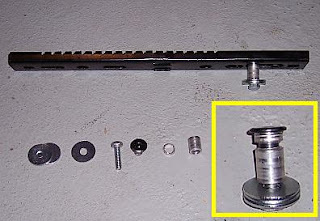 Since the pipe may decrease slightly in size, the larger spacers may need to be reamed or filed so the flat head caps can slide through (see photo on right). The smaller spacers can be made by putting a flathead cap in the pipe as the ring is cut so the rings don't collapse. This saves a step since there is no need to file the rings to fit! After the spacers are made, for each hole, take the bolt, put a washer or two on it to take up some length, then push bolt up through the hole. 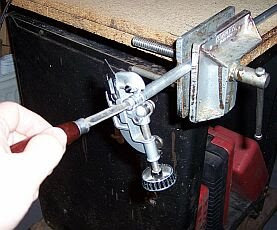 Then put on another washer, then put the large aluminum spacer on, put the rail on spacer, then cap off with the flathead nut (with smaller ring installed on it). Then tighten with an Allen wrench. You now should have some pretty nice looking lower sliders! Then, mount the upper sliders to the seat based on measurements from the installed lower sliders. Careful not to get the sliders backwards! Note the position of the teeth in the lower sliders and handle on the upper ones. Loosely install the top rails to the seat with bolts, washers & nylock nuts. Then wiggle on seat to the mounted rails. If movement is stickey, add a small amount of oil. Once everything fits, jam each nylock nut with a screwdriver & tighten each bolt from the top of the seat. Then install supplemental padding in the seat if you want some & put on the seat cover which is included in the kit. The seat should now freely move back and forth & can be easily removed when servicing is needed.